An unfortunate leak left Sonos's new Play:1 speaker exposed last week, but today it's going official and will be available from October 29 in the UK. The relatively affordable Play:1 wireless speaker might be small but having tried it ourselves, we can confirm it packs a considerable sonic whack with a nice wide field of sound. While you'll likely be tucking this away in some corner of the room, there's also the option to fix it to the wall with the mount. You also get a choice of both black and white variations. Using the Sonos app on iOS, Android PC or Mac, you can stream songs from your personal library or other services such as Spotify, Rdio and Napster, so chances are you've already got the control bit covered. Unfortunately these are wi-fi only - no Bluetooth support on board. On top of the speaker is a button that lets you play and pause music in a press, and buttons for adjusting the volume in case you don't have the controlling device at hand for whatever reason. 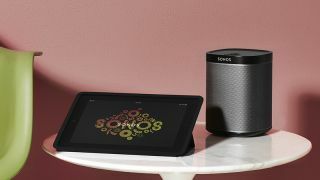 Of course, the Play:1 is best combined with others of its type or with other Sonos speakers around the home to get that full multi-room HiFi effect. The Play:1 hits the shelves for £169 and, we're currently told, $200 in the US (still waiting on an Australian price) and for a limited time all Play:1 speakers purchased in the UK will come packed with a free Bridge, which normally retails at £39. Not a bad deal, really. Look out for our verdict in our full review coming very soon.